Ed Aronin #11 who was an outstanding West High athlete who played football, basketball and baseball while his parents owned Charleston Hardware. Ed and Bob Bellar were named to the ’61-’62 1st Team All-Capital League while Steve Bramwell played on that team as well who lost to East in the 1st round of the WCD Tournament. The Bremerton Sun would come to each local high school before basketball season and take individual player photos. Greg-You are welcome while might add a bit more regarding the photo as it was taken prior to the start of basketball season and was published in a Friday afternoon edition(remember when the Sun was available and delivered in the late afternoons except on Sundays) of the Bremerton Sun when West-East played on that particular night with an article about the pending match-up. 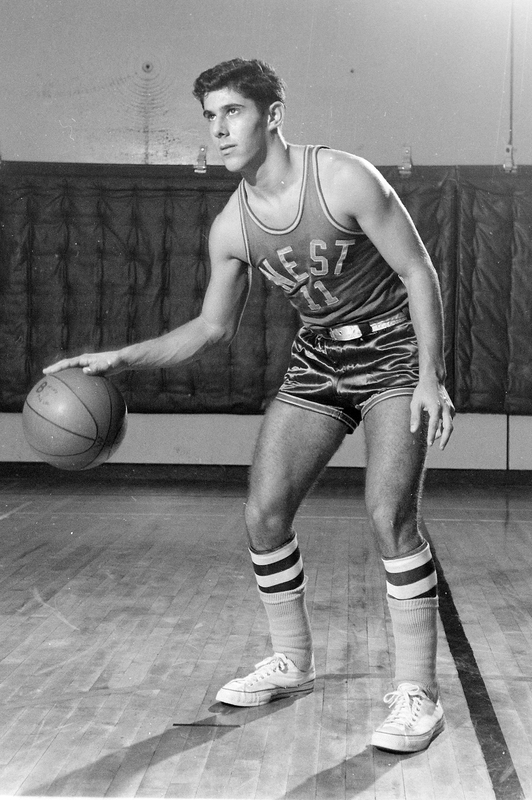 In 1963 there was a individual Player photo taken of Leon Leslie dribbling the basketball with his right hand and his left hand and index finger pointing outward. The caption of the photo in the Bremerton Sun that night was “Leon Leslie pointing to the T-Birds” as West played the Mt. Tahoma Thunderbirds(T-Birds) on that particular night.